Click Here To See Creatures on the Loose #33 Comic Book! 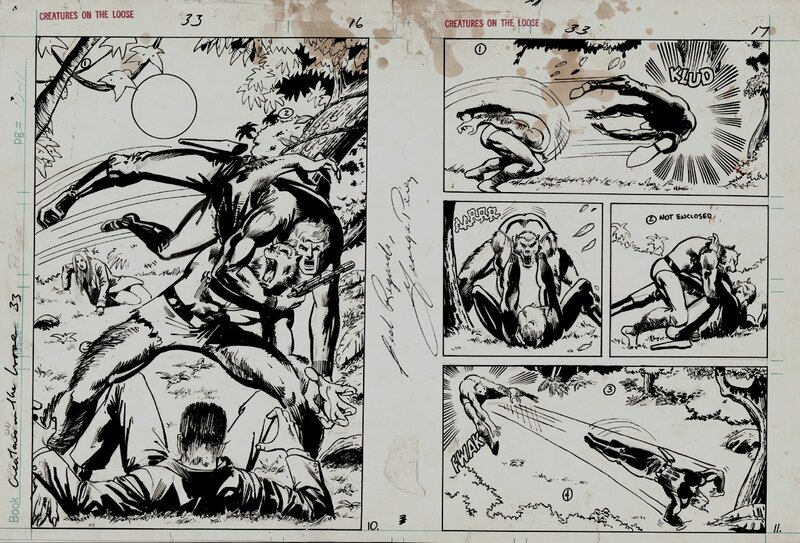 Check out This 1975 Bronze Age Marvel double page SPLASH and page, which was drawn on one 11 by 16.5 inch art board, by George Perez with Klaus Janson inks featuring Man-Wolf AKA John Jameson attacking his own father, J.Jonah Jameson. Man-Wolf is stopped by Special Agent Simon Stroud. One of beloved artist George Perez's first assignments was "Man-Wolf" in Marvel's Creatures on the Loose title. 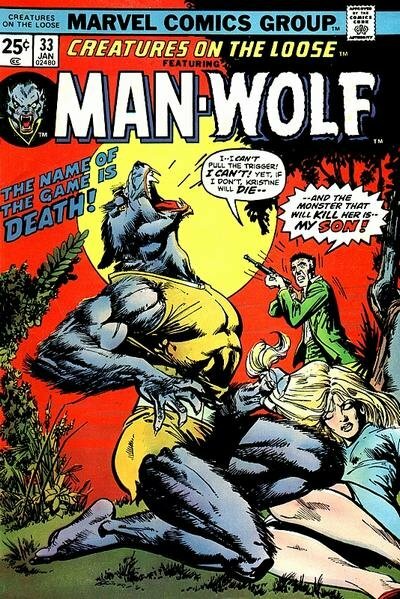 Man-Wolf was John Jameson, the astronaut son of J. Jonah Jameson, who was exposed to a mystical ruby while on the moon that transformed him periodically into a werewolf. John Jameson had first appeared way back in the landmark Amazing Spider-Man #1, the 1963 issue that also introduced his famous father. He became Man-Wolf in 1973's Amazing Spider-Man #124. ALL art on our website (including this one) are able to be purchased with VERY fair time payments, and trades are always considered towards "ANY" art on our website! Just send us an email to mikeburkey@aol.com and we can try to work something out.